I’ve been maintaining my DotNetNuke Visual Studio project templates for a number of years now, one of the things they have sorely been lacking is the ability to “customize” the templates without having to crack open the full source code of the VSIX project, making changes, and then recompiling everything. There are 5 specific strings/values that were ripe for customization, but simply were not easily accessible. Root NameSpace – The Namespace for the project, all of the files were populated with this namespace. Owner Name – A DNN Manifest property that is used to provide information on who either developed the module, or commissioned the module development. This also gets used in all of the Copyright statements built into the templates. Owner Email – Another DNN Manifest property, used to provide an Email address for contacting the owner/developer of a module. Owner Website – The URL of the package’s owner, for further contact and information. Local DEV URL – The URL of your local development environment. Of all of those items, the one that has likely caused the most headache over the years is the Local DEV URL property, that was set at DNNDEV.ME, which if you followed along with my various tutorials, was the URL I always use for local development, that domain name points to 127.0.0.1. This actually works out great, but some people choose not to follow my tutorials or already have existing development environments configured, yet still want to use my templates. You could still use them, but you had to make some modifications to the PROJ files after creation in order to get things working. 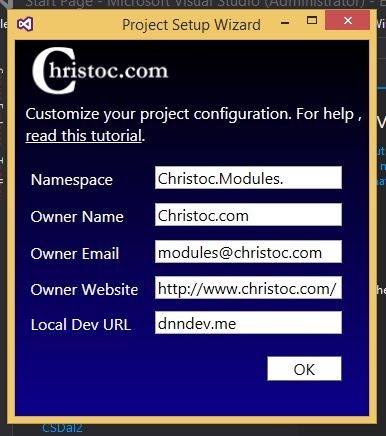 With the latest release of the templates, when you create a project using one of the 6 included templates, you will then be prompted with a Wizard interface (single step) that will allow you to customize these fields. Nice! This is similar to my MVP templates for a few years ago. I am actually relieved you did this because I don't have time to redevelop mine for DNN8 before the upcoming DNNCon. I will be using this in my training. I may also try contributing packages unit tests to your code as well if you are interested. Thanks Chris!